I started writing this blog to provide an outlet for my galactic ideas. 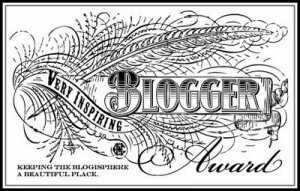 It appears they strike the right chord with my fellow readers as I have recently been nominated for the Very Inspiring Blogger Award. The blogger that nomiated me is Kyle Reece (great name by the way) over at http://365storyteller.com. Kyle has been keeping this great blog up for a bit over two months, and has produced a story a day without fail; a feat in and of itself. I am glad to have inspired a fellow blogger. Sometimes I feel I may have missed my target, but then something like this happens. Kyle has spoken very kind words of my blog and I would like to do the same. Please check out his writings (more than 60 to date). It is truly Flash Fiction. Onebreathmeditation over at: http://onebreathmeditation.wordpress.com. This blog has shown so many people the simplicity of meditation; something that many would never discover if not for the easy-to-read delivery given on onebreathmeditation. If meditation advice isn’t inspiring, I don’t know what is. and Kyle over at: http://365storyteller.com. Kyle has accomplished a great feat. No matter what you are writing it is impressive to be able create a new story each day. The creative juices are definitely flowing through his keys (just 15 years ago it would be the pen). Kyle is an inspiration to each of us. I have trouble putting a story up each week, let alone each day. 5) Notify those bloggers of the nomination and the award’s requirements. Kyle, Thanks again. This nomination made my week.